The McPherson Square Metro station is currently closed due to a burned out cable that caused significant smoke in the station. The Blue and Orange line are currently severed between McPherson Square and Metro Center, so be aware that this will definitely impact getting around the core of the city on the Metro today. Metro’s operating a shuttle between the two stations, but there’s a 40 minute delay expected on the system right now. Ouch! 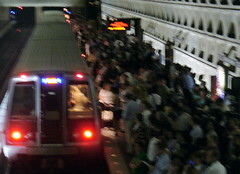 Update: Metro has reopened McPherson Square, but trains are single-tracking through the station at this time. Expect delays.